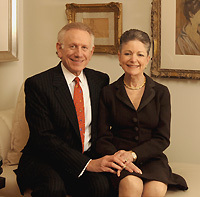 When Ron and Barbara Balser, co-chairs and CEO of the Balser Companies, were approached about providing art for The Goizueta Foundation Center for Research and Doctoral Education, they agreed but with one caveat: The couple did not merely want to write a check; they wanted to be an integral part of the process. Barbara and Ronald Davis Balser are firm believers that art expands one’s thinking. The couple, pictured here among artwork at their Buckhead penthouse, selected more than 180 works of art to enrich the lives of those who study, work and visit Goizueta. The collection encompasses more than 180 works by internationally known artists such as Picasso and Warhol, and four granite-crafted benches. At a reception on April 20, guests were treated to wine and cheese, music by a roving quartet, tours of the artwork, and a souvenir art guide of The Balser Art Collection. Among the attendees were their daughters Ginger Balser Reid ’93BA, and Laura Balser ’94BBA-’01MBA, vice president & director, Client Relationship Management at the Balser Companies, a leading, privately owned executive benefits practice. Also in attendance was Laura’s husband, Major Matthew D. Smith ‘01MBA, who is currently serving as a brigade Operations Officer on active duty for the Georgia Army National Guard.